Making bread is not easy, even though you think you have followed every single step of what the recipe said. For me, I have spent an awful lot of time practicing. I can't count how many times that I have failed. The most common mistake I usually make is the 'yeast' step. Sometimes the yeast is over-risen, or sometimes the yeast is not active. So this is always a tricky step. Recently, my husband bought me a KitchenAid stand mixer. It is a very useful machine, especially in kneading and mixing. I have been using it a lot in the kitchen. I seldom buy bread as I always bake the bread myself. I am full of confidence now. Yesterday, I thought of making some buns with apple sauce. I had never tried this recipe before. Since it is apple harvest season right now, why not make use of the apples. I was happy that the buns came out very moist. The only disappointment was that the apple flavor was a bit weak. Even so, I didn't think it was a worthless idea as the apple sauce would still give us nutrients. I was planning to bake all the buns in single cups. Unfortunately, I didn't have enough cups, so I had to bake the rest in muffin cups instead. I love using cute single cups. The buns always look so elegant when they are served with the cups. In this recipe, I tried to minimize the steps so that it would be easy to follow. Done Kneading. Waiting for the dough to rise. The dough has doubled in bulk. Combine 1/2 cup lukewarm water and 1 teaspoon sugar. Add yeast to the water and stir to dissolve. Let stand for 5 minutes or until foamy. In a bowl of a stand mixer, using a flat paddle attachment to beat shortening until creamy. Add egg, apple sauce, 1/2 cup sugar, skim milk powder, and salt to the shortening and continue beating at medium speed. Switch to a dough hook. Add 1/2 cup of flour at a time to the mixture and mix it at low speed until 3 1/4 cups are done. 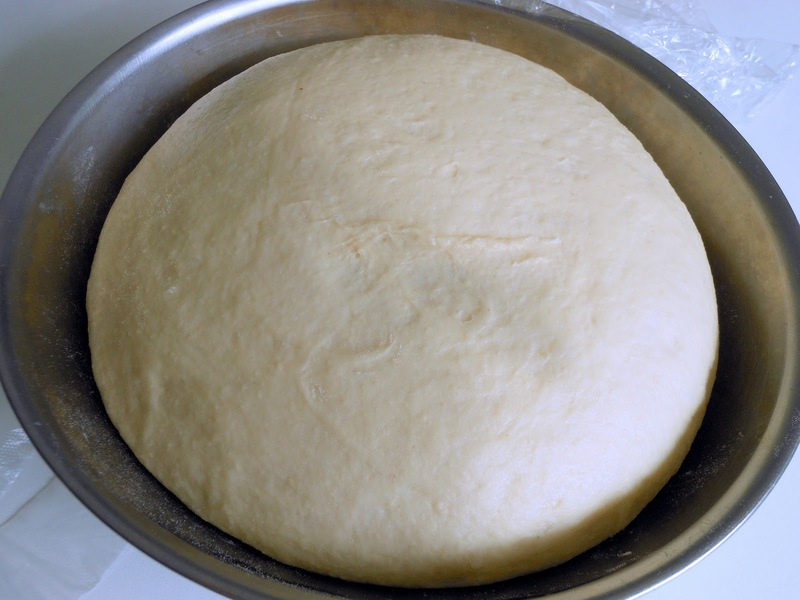 Turn up the speed to medium and knead for about 8 to 10 minutes or until the dough is formed. 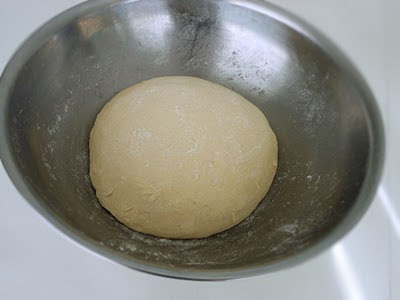 Place the dough in a floured bowl. Sprinkle some remaining flour over the top of the dough if it is still sticky. Knead the dough slightly by hands until it's smooth. Gather the dough and sprinkle some flour over the top again. Cover with plastic wraps. Put the dough onto a floured surface and divided into 24 - 28 pieces. Roll each piece into a ball. Place them into each greased muffin cup or greased single cup. Cover with plastic wraps. Let rise until double. Brush syrup on the buns. Sprinkle cinnamon on top. Let cool. 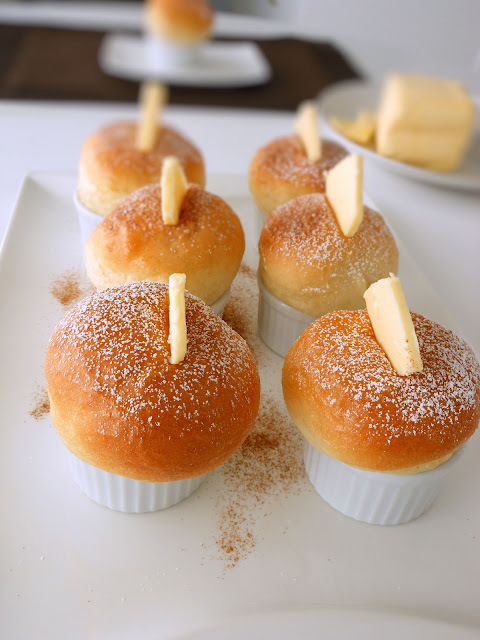 Using a knife, cut a small opening on top of each bun and insert a small piece of butter diagonally into the opening. Sprinkle some icing sugar on top and serve. In a microwavable bowl, mix the ingredients and microwave for 30 seconds. Set aside. Evelyn! These look simply GORGEOUS!!! Mr. Sweet Butter just may marry me all over again were I to make these for him!! Fantastic work! Definitely going to pin this. Thanks so much for your kind word. I love your blog too. I'm glad that I found it today. Will add your blog to my favorite list, for sure!